The same technology that made the scenes pop from the screen in The Amazing Spider-Man movie last year is being harnessed by surgeons here to help them perform keyhole surgery better. A state-of-the-art three-dimensional system, on trial at the National University Hospital, actually allows operations to be done faster, and is less tiring on the eyes for surgeons. 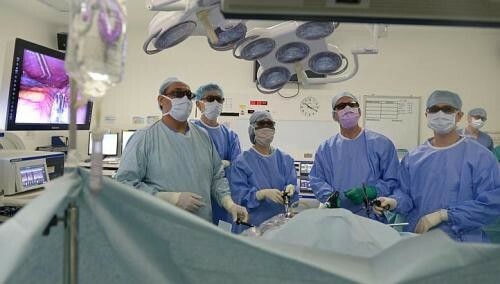 "Operation times are about 20 per cent faster now, and this means they are safer and the risk of error is reduced," said Associate Professor Davide Lomanto, senior consultant at the National University Hospital's Department of Surgery. "There is also less fatigue and eyesight deterioration for the surgeon," he said. Keyhole surgery is widely used in hospitals here to minimise the injury to the body by using only a small incision. The benefits for the patients include less pain after their operation, shorter hospital stays and faster recovery times. With the new 3-D technology, also called stereoscopic vision, the surgeon and his team wear lightweight 3-D goggles, which restore the depth perception that is lost with conventional two-dimensional video-assisted systems. Proponents say it provides a precise spatial view of anatomy, improves the surgeon's hand-eye coordination, and is especially beneficial in performing more complex tasks such as suturing, giving surgeons an added layer of realism so they feel more like they are performing the surgery with their bare hands. While such technology has been available since the late 1990s, it was only in recent months that it has been refined enough to prevent surgeons from being giddy and nauseous while operating, he said. According to a German study released earlier this year, 50 surgeons using the new technology showed improvements in surgical precision and speed. Fraunhofer, Europe's largest application-oriented research organisation, said in a statement: "Thanks in particular to improved 3-D glasses and screens, practical tests have recently shown that 3-D systems used in medical technology have benefits that were once believed to be purely theoretical." The Fraunhofer Institute for Telecommunications was involved in the study. The researchers showed that even experienced physicians could benefit from the latest generation of 3-D devices, said the organisation. Prof Lomanto, who believes this is the first such effort to implement 3-D surgery in Asia, is working with tech giants Sony and Olympus to fine-tune the system at NUH by creating a new 3-D environment in the operating rooms and surgical training facilities. Over the last three months, he and his colleagues have used it to perform about 40 operations, ranging from hernia repair to stomach reductions. "I have been able to halve some of my operations from 90 minutes to 50 minutes," he said. In a few years, he predicts that the majority of keyhole surgeries will be done in 3-D. The added depth makes it easier for young surgeons to learn and perform surgical tasks during minimally-invasive surgery, added Prof Lomanto, who is also Director of the Minimally Invasive Surgical Centre at the hospital and head of the Khoo Teck Puat Advanced Surgery Training Centre under the National University of Singapore. Plans are under way to train several thousand surgeons in Singapore and the region each year. While trainees here can do hands-on training at the centre, those abroad can also get the 3-D experience by watching operations broadcast on special projectors with their 3-D glasses.